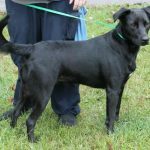 Goose is a 2-year-old male Black Lab mix who has already been neutered. He came to PAHS as a stray and his owner did not claim him. Goose is almost completely black and he has just a little white on his chest. He currently weighs 58 pounds so he is considered to be a large adult dog. 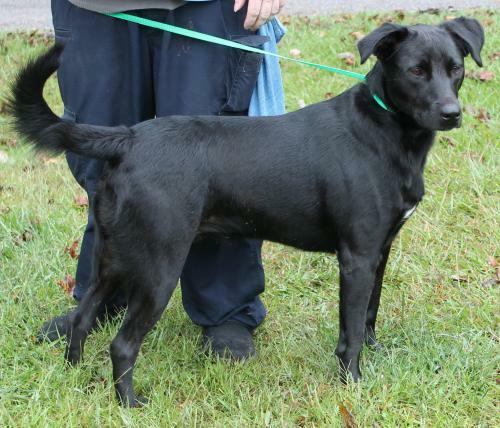 Goose is a typical Lab–active, playful, and full of fun. We know he would love to have a nice fenced yard where he could safely play. Goose has a laid back and easy going temperament that would make him a great family dog. He is good with other dogs but does show some slight food aggression so he would need to be monitored at meal time if you have other dogs. We would not recommend Goose be in a home with cats. This handsome dog is great with children and would love to be in a home with kids. Goose is already leash trained. Goose is just a great all around dog who is going to be a treasure of a new family member for some lucky adopter. Dogs and puppies may be adopted for a fee of $120. All cats and kittens may be adopted for $50.00 Our adoption fees cover a microchip, microchip registration, discounted spay/neuter, deworming, vaccinations (as age and law requires), and a courtesy vet exam at participating offices. The shelter is located at 1009 Reuben Road in Prattville. It is open Monday through Saturday from 11 am until 4 pm. For more information about our shelter, please call 358-2882, find us on Facebook at Prattville/Autauga Humane Society, email [email protected], or visit our website at www.prattvilleautaugahumane.org. Thank you so much for helping us find wonderful pets wonderful homes!